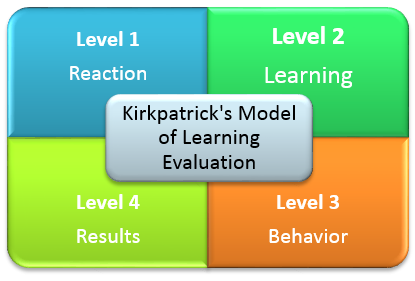 The eLearning industry relies tremendously on the 4 levels of the Kirkpatrick Model of Evaluating a training program. And like I mentioned in my last blog, “When each of these levels is examined individually, you will find that there is scope for deeper and more refined evaluation of a training program at each level. But there is also scope to find loopholes in each of these levels – although these are few and far between”. This blog will look at the advantages and disadvantages of the Kirkpatrick Model of Evaluating a training program. The model can be used to evaluate classroom training as well as eLearning. The model provides a logical structure and process to measure learning. When used in its entirety, it can give organizations an overall perspective of their training program and of the changes that must be made. It has been used to gain a deep understanding of how eLearning affects learning, and if there is a significant difference in the way learners learn. There are those who question the efficacy of this model at each level. The argument: The argument against this level is that, very often reactions are quick, sudden, and made on the spur of the moment. Therefore, it would not be right to make changes to a program based on learners’ reactions. Evaluation is superficial and limited to only understanding the learner’s views on the training program, the trainer, the environment, and how comfortable he was during the program. Advantages: Pre-tests and post-tests must be conducted to measure the true amount of learning that has taken place. This level gives trainers and managers a good idea of the advancement of knowledge, skills, and attitudes after the training program. The argument: This involves time and effort, and costs money. A lot of organizations do not want to go through this effort as they see it as a waste of time. Advantages: There is visible proof in whether the newly acquired skills, knowledge, and attitudes are being used, on the job, on a regular basis – and if the newly acquired skills, knowledge, and attitudes are relevant and purposeful to learners’ jobs. The argument: In order to carry out this level of evaluation, learners must be provided regular reinforcement and follow up – which again is time consuming and costs money. It won’t stop just there – there would need to be an in-depth analysis conducted into the reasons for failure. Managers must take charge of evaluation at this level. They often do not have the time or inclination to carry out this training evaluation. Advantages: This level measures the success of the training program based on its overall impact on business. The argument: It is difficult to clearly and with 100% accuracy link a particular training session to business results. This would need expertise and therefore work out to be more expensive. So is this really the best method of evaluating a training program? If you look at the arguments of the opposing side – the arguments put forward by them are to do with three things: Time. Money. Effort. There is also another component – laziness, and a lax attitude – not bothered about analyzing and wanting to know how a training program faired, what made it so successful, or how it could have been bettered. For example, Level 3 must be conducted by managers. But most managers don’t take training seriously enough to think that it warrants this level of evaluation. And it all boils down to this one question. Do the people who oppose the Kirkpatrick Model of Evaluation, really care about their employees and the training they just conducted, at all? Here is a model that when used – as it is meant to be used – has the power to give us immensely valuable information about our learners, their needs, what works for them, and what does not work for them, and how they can deliver better performance. Time, money, and effort – they are big on everyone’s list, but think of the time, money, and effort that is lost when a training program is not evaluated or made better – more time wasted, less business that could lead to financial loss, and the effort that goes into a half-baked training program, are all wasted. So yes, this model is still one of the most powerful tools used extensively by the wise. There was someone though who instead of just finding loopholes in this model, actually found a way to better the Kirkpatrick model. His name is Dr. Jack Phillips. The Phillips Model adds a fifth step to the Kirkpatrick Model of Evaluation – Return on Investment. We will look at this new version and see if it is different than or better than the Kirkpatrick model. All this and more in my upcoming blogs.